People with holiday birthdays frequently find that the festive season can take priority over their special day!! In a national survey conducted by Chase Freedom, a third (32%) of those surveyed with holiday birthdays felt that they were celebrated less. In fact, the survey found that one-fifth of Americans admitted to forgetting, ignoring or deliberately downplaying someone’s birthday because it falls on or near a holiday. I’ve recently partnered with Chase to shine a spotlight on holiday birthdays. If you didn’t know, I actually got my start by baking birthday cakes for friends, so this is a particular passion of mine. There is nothing quite like the look on someone’s face when they see the cake you’ve made just for them! Last week, I helped host a birthday celebration at a local New York City Chase branch by creating a traditional holiday feast with a twist – they were made entirely of birthday cake, complete with sprinkles, funfetti and rainbow swirls inside! As you can imagine, guests were surprised to see cakes in the shape of a ham, a skillet of Brussels sprouts and even a cherry pie. 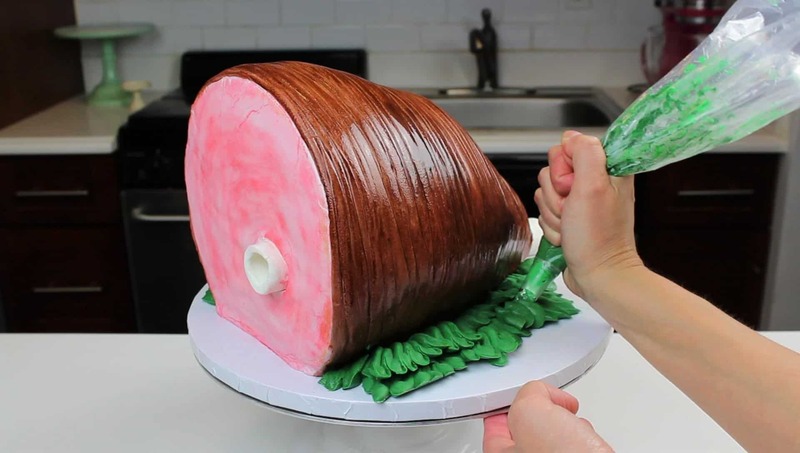 To make the Holiday Ham Cake, bake two 8 inch layers, two 7 inch layers, two 6 inch layers, and one 4 inch layer. Once baked and cooled, use a 4 inch circle cutter to remove the centers from one of the 8 inch layers, and two of the 7 inch layers. Prepare the buttercream, then stack and frost the layers from largest to smallest, along the side of cake. 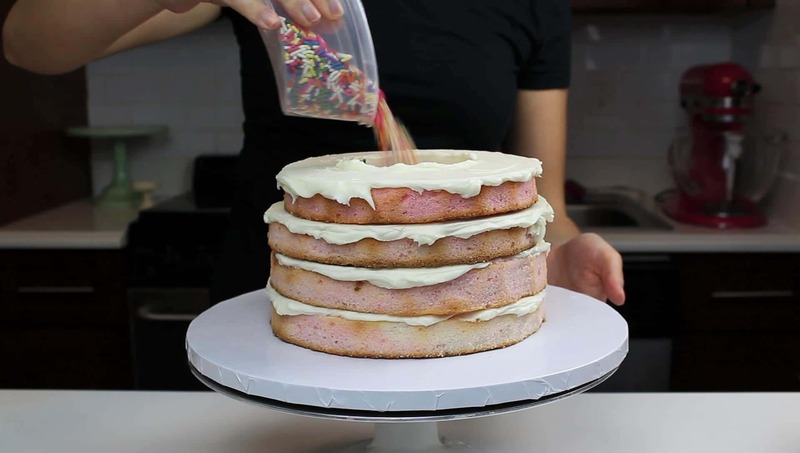 Once the layers without centers are stacked, apply a thing crumb coat the cut out areas, and fill with sprinkles. Top with remaining cake layers. Stacking them off center will make it easier to lay the cake on its side once it’s carved. 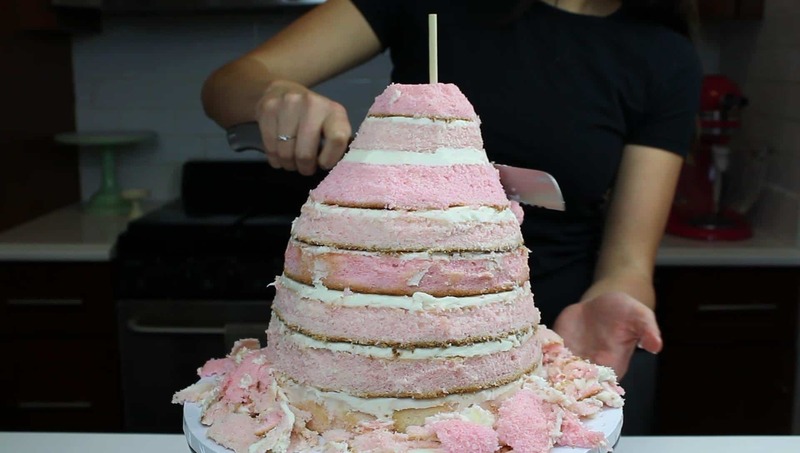 Insert a wooden dowel through the cake to secure the layers, then use a serrated knife to carve the layers, to resemble the shape of a ham. Trim the side of the cake closest to the dowel, to make a flat surface to lay the cake on. Carefully flip the cake onto its side, then apply a thin crumb coat of frosting. Place an 8 inch, pink fondant circle on the front of the cake. Lay brown fondant over the side of the cake, and trim excess. 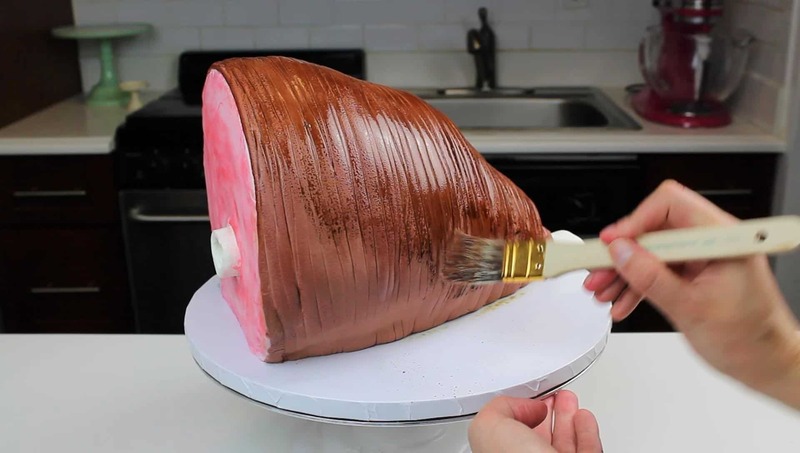 Score lines around the sides of the ham using a fondant tool. Add a white fondant tail bone over the exposed dowel on the back of the cake. Cut out 1 inch of pink fondant using a circle cutter. Place a white fondant ring into the cutout, to be the other end of the bone. Use a kitchen torch to caramelize the brown fondant, to give the ham a “fresh out of the oven” look. Next, paint the brown fondant with a mixture of vodka and brown gel food coloring. 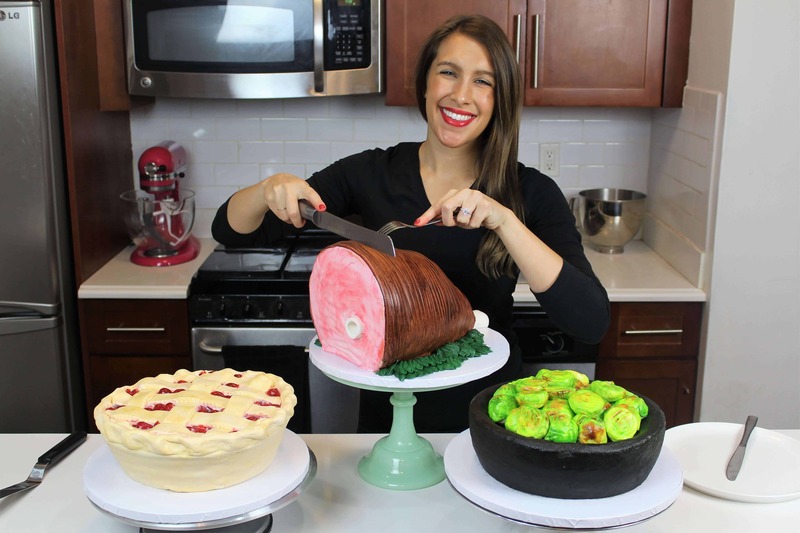 In a small container, mix together a drop of red gel food coloring with a 1 Tbsp of vodka, and lightly dab onto the pink fondant to make the ham look juicy. The last step is to pipe some dark green buttercream around the ham cake as the leafy garnish. 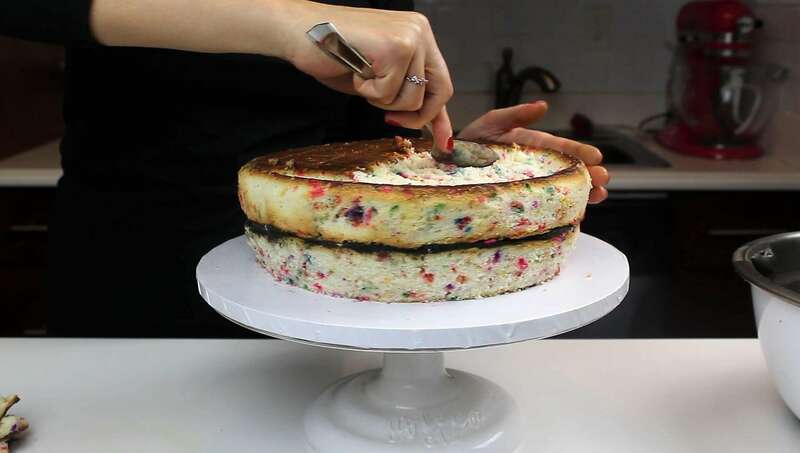 To make the Brussels sprouts cake, make two 10 inch funfetti cake layers. Prepare the black buttercream, and stack and frost the two funfetti cake layers. Trim the sides of the cake to taper in slightly towards the base. Scoop out about 1/2 inch from the center of the top layer, leaving a 1 cm rim. Coat in a thin crumb coat, and chill the cake in the fridge or freezer until the frosting is firm to the touch. 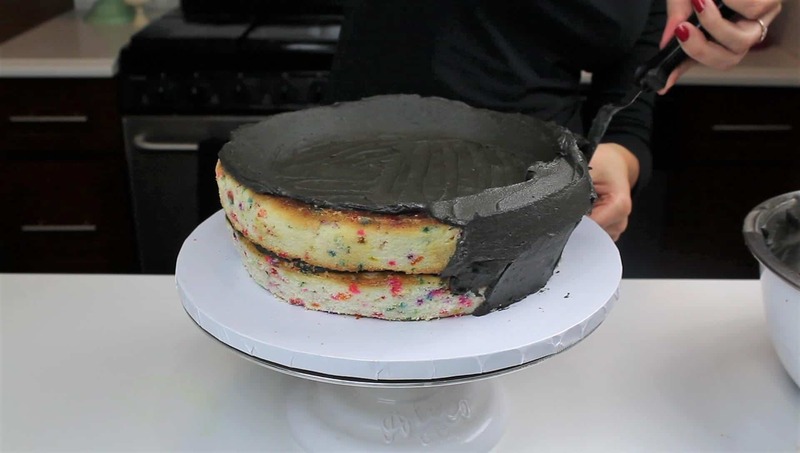 Add a second, thicker layer of black buttercream, and smooth using a piece of acetate sheet. Next, prepare the Brussels sprouts! 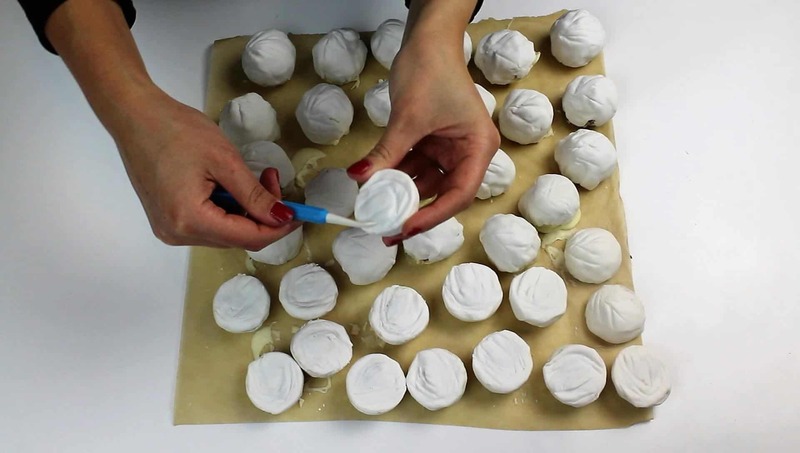 Make cake balls using trimmed cake bits and extra white frosting from the ham cake. Form twelve 1 inch balls, and freeze. Use a silicon mold to make 12 half spheres. Coat in a layer of white chocolate (you want them to have the texture of real Brussels sprouts, so they don’t need to be perfectly smooth! ), and set aside to dry. Once firm to the touch, cover in a thin layer of white fondant. 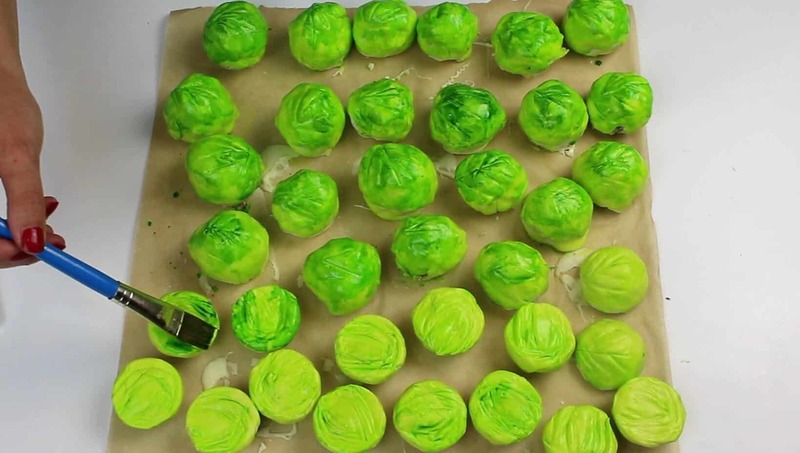 Create lines along the top of the cake balls to look like Brussels sprout leaves. Paint a couple layers of bright green food coloring mixed with vodka. Then paint an additional layer of forest green food coloring to give the Brussels sprouts more dimension. Set aside to dry. Once the food coloring has dried, arrange on top of the skillet cake. 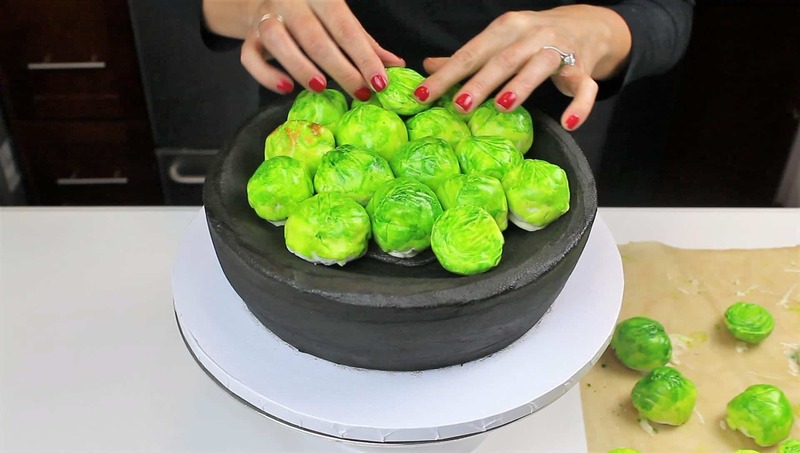 Start with the largest Brussels sprouts in the center of the cake, and work towards the edge of the cake. Fit as many as possible in the base layer, then add half of the Brussels sprouts into any remaining space, and on top of the first layer. 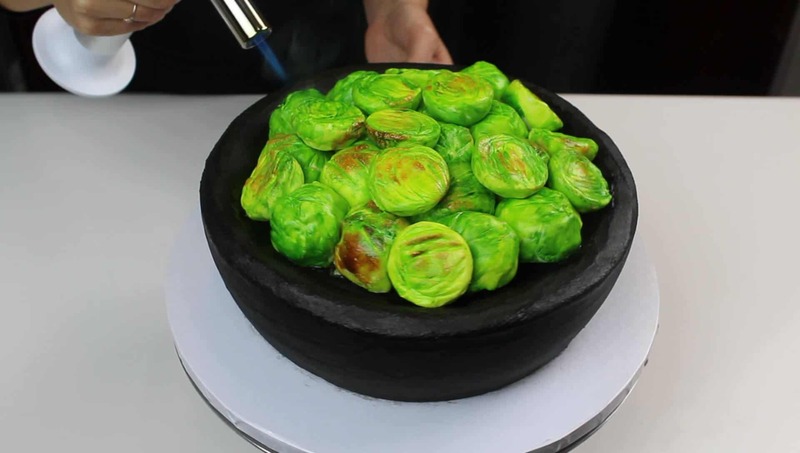 Carefully use a blow torch to caramelize the Brussels sprouts and avoid touching the frosting with the flame! 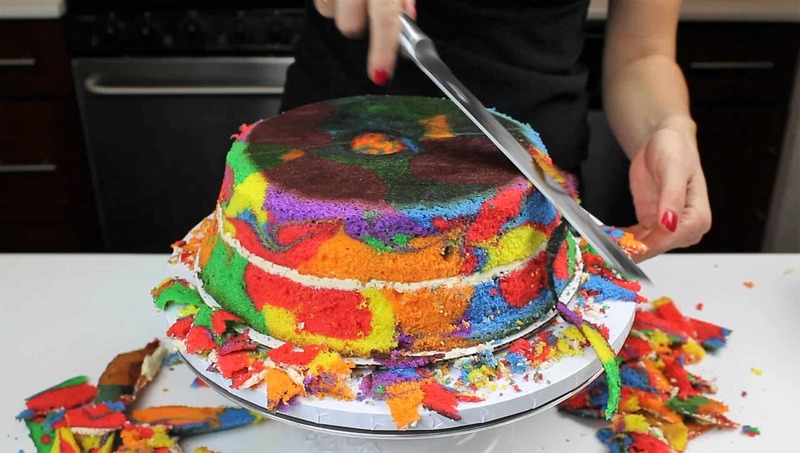 To make the cherry pie cake, bake two 10 inch cake layers, by swirling together rainbow colored batter. You can watch a full tutorial on how I make my swirled cake layers here. Prepare the tan colored buttercream, and stack and frost the two colorful cake layers. Trim the sides of the cake layers to taper. Flip the cake over so that the widest part is facing up. Scoop out about 1/2 inch from the center of the top layer, leaving a 1 cm rim. Coat in a thin crumb coat, and chill the cake in the fridge or freezer until the frosting is firm to the touch. Add a second layer of buttercream, and smooth using a piece of acetate sheet. Cover the sides in tan fondant, and lightly score using a fondant tool. 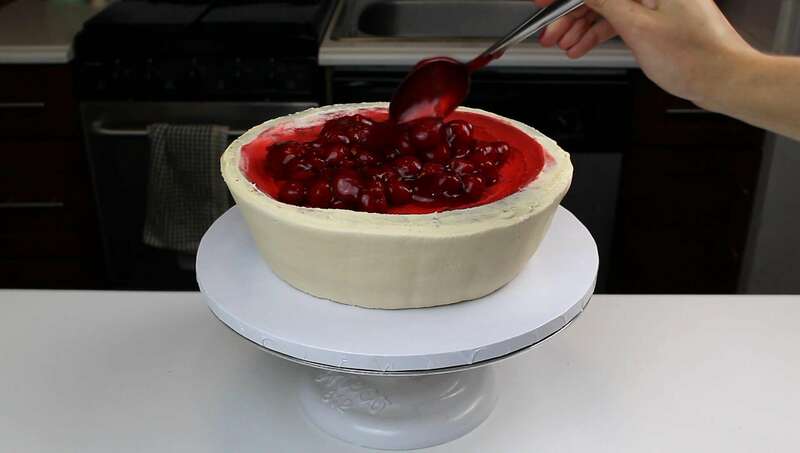 Add the cherry pie filling onto the top of the cake, leaving a 1 inch boarder around the perimeter. Interlace 1 inch strips of fondant to create the pie crust top, and trim to fit a 10 inch circle using a cake board. 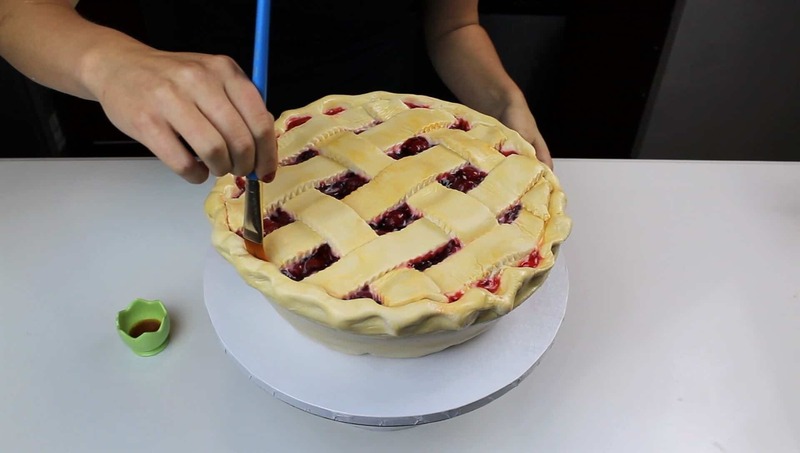 Place a ruffled fondant pie crust boarded around the perimeter of the cake, then carefully place the latticed strips on top of the cherry pie filling. 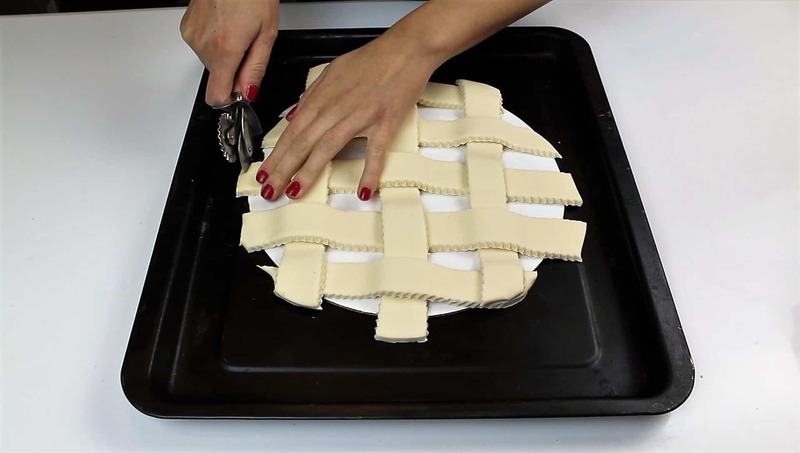 Secure the strips over the crust by gently pressing them together. Paint the top of the pie with 1 drop of ivory food coloring mixed with 1 Tbsp vodka, to give the cake a golden brown hue. Then it’s time to present the feast of cakes and cut in to reveal the birthday surprise centers!!! Thanks so much!! 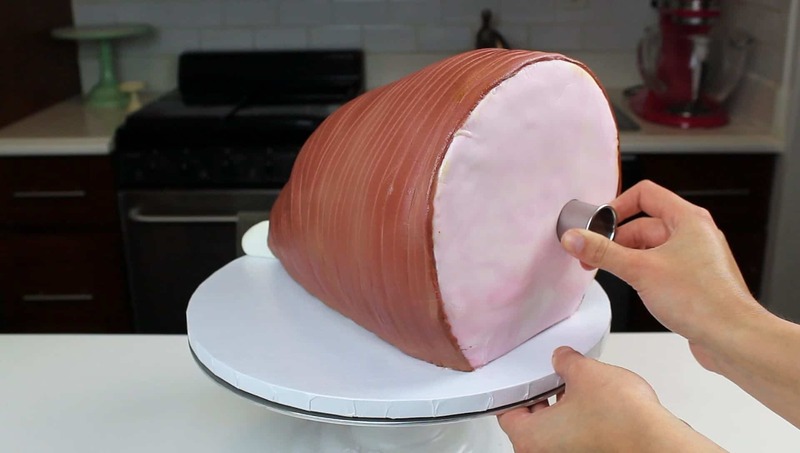 The “ham” cake would be great to make for my church pot luck! They’re all vegetarian! It would be hilarious ??? haha!!!! That would be too funny!